Schaeffler is digitally transforming its entire business, which involves the integration of its mechatronics components, systems and machines into the rapidly expanding world of the ‘Internet of Things’. Through its Machine Tool 4.0 project, Schaeffler is demonstrating that Industry 4.0 is not an abstract, remote vision, but one that can make a contribution to added-value today. The digital networking of production facilities along the entire value chain is one of the most important goals of Industry 4.0. Schaeffler sees itself not only as a supplier for smart factories, but also implements new technologies at an early stage in its own volume production. The goal of being able to respond more quickly and flexibly to current developments in a rapidly changing world is a key motivation for Schaeffler to digitise its processes in all areas. In the future, the company will digitally map the entire product lifecycle, from the initial concept to a new product, and from digital production planning to sales management. Schaeffler’s components, such as bearings and linear guidance systems, are used in critical areas of machines and can produce critical information about conditions and movements. In recent years, the company has invested heavily in research and development and has incorporated sensors, actuators and control units with embedded software into its products. With this, it is now possible for these parts to collect and process valuable data on the condition of a machine and then convert this data into added-value services. 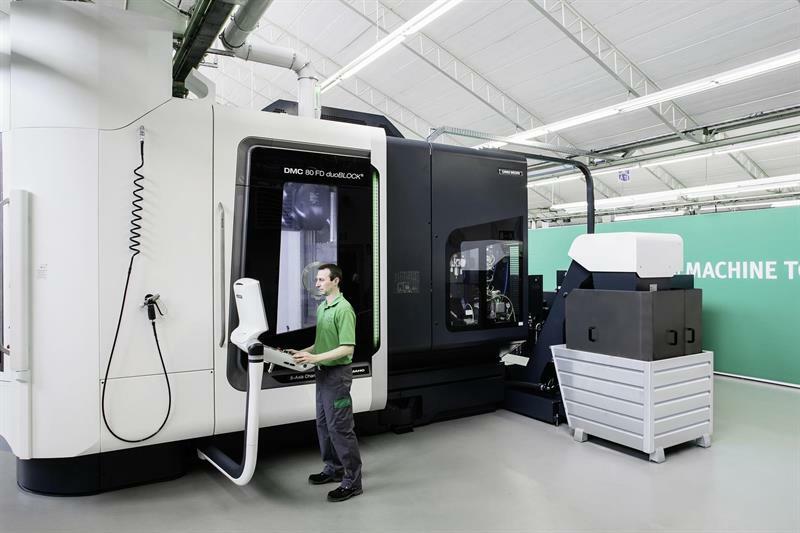 At the company’s Hoechstadt plant, a DMG Mori (https://is.gd/equmos) machining centre equipped with several dozen new and additional sensors generates large volumes of data that can be evaluated in the Cloud. The machine is not used in a research laboratory but in the ongoing volume production of high precision bearings. This means rolling bearings that are, in turn, used in machine tools. The diameter and roundness must comply with the target specifications to approximately two microns. Explains Sebastian Mergler, project manager, digital services at Schaeffler: “In more than 60 different positions, the machine is equipped with sensors that record measurement values for pressures, vibrations and forces. These are primarily integrated in components that Schaeffler already supplies, such as in spindle bearings and linear guidance systems. These components are positioned precisely where things move on the machine. Data is saved not only in the machine itself but also in pre-analysed form in the Schaeffler Cloud. Communication with central servers takes place via a secure gateway. The condition of individual components on the machine tool can be viewed at any time, either using the operating terminal on the machine or using a device connected to the Internet, such as a tablet or smartphone. To categorise the measured data, each component manufactured on the new machine receives its own ID via a unique data matrix code. All data generated during milling or in the subsequent machining processes can therefore be assigned later to a specific component. By comparing the data for the individual components, Schaeffler will be able to quickly recognise deviations, correct these, and, in turn, continuously optimise the manufacturing processes. The company says that the possibilities are huge, ranging from higher precision in soft machining, to reducing energy consumption and lubricant supply. To set and inspect the precise machine load is a complex task. The operating panel of the new machine tool allows the correct main spindle operating load to be set and the current loads can be monitored whenever this is needed. If the load limit is exceeded, an active warning occurs and the load can be adjusted immediately. This also covers vibrations on the machine components. Moreover, the effects of temperature fluctuations on the forces can be checked via the operating panel. Demand-based lubrication on the machine also ensures that resources are saved, while also safeguarding the bearings’ functionality and, thus, the performance of the machine. The sensors in the machine send signals that allow, among other things, analysis of the condition of the lubrication film at critical points in the machine. If the condition is no longer sufficient, a signal will be sent to the Schaeffler CONCEPT8 unit and the required quantity of fresh grease is delivered to the bearing position. Machine downtime caused by insufficient lubrication can therefore be eliminated. Furthermore, the CONCEPT8 equipment reports on the remaining quantity of grease in the cartridge. Usually the grease cartridge filling levels had to be checked directly on the machine. Now it can be controlled digitally on mobile devices. The pilot project in Hoechstadt intends to demonstrate how significant the productivity gains are through the improved use of data. What is important is that the project uses a real production process, which means Schaeffler can identify how Industry 4.0 works in practice, where the challenges lie and how added value can be generated. Ultimately, it is hoped that the company will benefit from the pilot project in two ways. First, it can present itself to the manufacturers of machine tools as a solutions provider for Industry 4.0; second, it can use the knowledge within its own production processes. Digital twins are much talked about in connection with Industry 4.0, they are the digital representation of a real-world system. Siemens puts it more fully: “A digital twin is a virtual representation of a physical product or process, used to understand and predict the physical counterpart’s performance characteristics. Digital twins are used throughout the product lifecycle to simulate, predict and optimise the product and production system before investing in physical prototypes and assets. 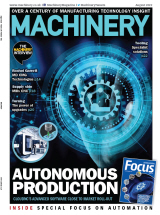 Digital twins are already in use, or being developed, by machine tool makers DMG Mori (read more: https://is.gd/bebado), Schuler (read more: https://is.gd/conoje) and AP&T (read more: https://is.gd/cozove) to reduce commissioning times, for example. But to think that digital twins are a well-defined technology would be a mistake. The UK’s High Value Manufacturing Catapult network surveyed over 150 engineers from across the organisation and associated companies (image, below). Of these, nearly 80% had heard the term digital twin, but there was no common understanding of what a digital twin was. Those surveyed were then given a number of scenarios and asked to consider whether or not they were digital twins. This highlighted the fact that there is still a wide variety of situations which could be described as digital twins, but which would not get widespread agreement. The Catapult has published a report that looks at the history of digital twins and asks whether there is a place for immersive technology in this area (report here: https://is.gd/uwideb). Generally, immersion has a primary value in two situations; where depth perspective is required, and where there is a need to understand scale in relation to the observer. However, despite it being rare that these requirements occur in a digital twin, the results discussed indicated that 80% of people in the questionnaire believed immersion would be a valuable delivery mechanism. Voice commands for mobile phones and, more recently, personal assistants such as Amazon’s Alexis or Google Home are accepted and useful. At the IMTS exhibition in Chicago in September (see p42), Athena was demonstrated. Described as the first universal, voice-operated assistant technology specifically designed for manufacturing work, it was shown at work at the Makino (NCMT: https://is.gd/pucuxe) and OKK booths (Whitehouse Machine Tools: https://is.gd/iyiqug), as well as in the show’s Emerging Technology Centre, where visitors could control a 5-axis DMG Mori CNC (https://is.gd/equmos). “With 5-axis milling technology becoming more prevalent, operators need to know more to be highly productive,” says Dan Bagley, VP marketing and sales at iT SpeeX (http://athenaworkshere.com), the company behind Athena. “People don’t operate machines. People produce parts in a cell, and the machine is an actor in that cell. Athena provides intelligent assistance to machinists to allow them to operate multiple types of controls.” (IMTS video: https://is.gd/emukaq). The company adds that the integration of Athena can significantly cut down on the required time and investment in training novice machinists by providing a simple, common interface for working with machine tools. The technology can also assist even the most skilled operators by giving them immediate access to information that was not previously available. For example, with one voice request, Athena can search through a machine’s maintenance manual and display the needed information right at the machine.